東京原美術館於2018年舉辦的李傑展覽，圖為展覽其中一部份的室內情況，透過窗戶可看到花園。Hara Museum of Contemporary Art, Tokyo - an interior view of a section of Lee Kit''s exhibition and through the windows into the garden, 2018. The Task Force on Land Supply has just released its final report and recommendations. The independent Liber Research Community has responded vigorously with alternative ideas, analysis and conclusions (see links below). This is exactly as it should be. The Task Force’s report is not the final word on land supply and community discussion is now necessary. A missing ingredient in any Hong Kong discussion about urban development and planning is to introduce a philosophical or ethical element – for example, the sort of discussion introduced by protestors and independent commentators who offered alternatives to the alignment of the Cross-border fast train route and the terminus location, now built at West Kowloon. The city is restrained by past tried-and-tested pragmatic approaches to urban planning. Usually, government will adopt a ‘cookie cutter’ approach to a new development. You know the proposal: future developments will resemble (‘cookie-cut’) Tsuen Wan or Shatin or Tseung Wan O. The proposal will be a single large new town, centred around a big shopping mall, that also doubles as the community’s heart. Near the shopping mall will be an MTR station adjacent to a bus station; roads leading to surrounding mega-residential towers are serviced by buses and mini-buses. Arguing that fairness must be maintained, the needs of the private car will also be catered-for, resulting in ground-level open space predominantly monopolized by traffic and parking, and degraded by traffic noise and air pollution. It is clumsy urban planning. It begs to be challenged and radically overhauled. Not so long ago, architecture and the urban life were central to planning for society’s better future. Significantly, this year is the 100th anniversary of the beginnings of the Bauhaus – the reforming German school of modernist design and architecture. Modernist architecture coincided with the use of new materials, including reinforced steel and concrete, allowing greater design flexibility and engineering strength. After the First World War, political and social institutions were challenged by new social theories, psychology, literature, art and political movements. Cities were also being re-envisioned. Cities that had expanded in the 19th century saw inner-city crowding with lax planning controls and houses built amongst noisy workplaces and noxious factories. Significantly, mass transportation, in the form of commuter trams, trains and buses – faster and more efficient than horse-drawn transportation - were being introduced. The mass-produced, lower-priced car was the final (and still the most recent!) innovation to allow travelling flexibility and longer distances to be travelled. Mass transportation and the private car allowed easy access to new residential estates, enclaves and developments built on the outer fringe of the inner cities and further afield, the suburbs. Those with wealth, the middle-class and upper-classes, were attracted by the perceived healthy and safe environment of ‘garden’ residential developments. Escaping to the suburbs to live was a phenomenon seen in large cities throughout the world, including those in Asia. Shanghai, Jakarta, Surabaya, Saigon, New Delhi, Guangzhou, Manila, Tokyo and Hong Kong all experienced the growth of low-density residential housing in the suburbs. I recently visited an exhibition by Hong Kong’s most internationally seen artist Lee Kit, at the Hara Museum of Contemporary Art in Tokyo. The museum is an adapted modernist former residential building built in the 1930s and surrounded on two sides by a Japanese garden and an open lawn at the rear. The architecture is similar in style and of the same period as the original residential homes, with their rounded balconies and steel window fittings, seen in Kowloon Tong. Selections from the museum’s permanent contemporary sculpture collection are placed outside in the garden, as are permanent art installations within the museum. It is necessary to appreciate the architecture, the architectural detailing - particularly windows - the other art and parts of the museum, including the shop and café, to fully appreciate Lee’s exhibition. Rather than ignoring or competing with the museum’s architecture and its installed art, Lee actively embraced the form of the museum, and he strategically and subtly places his own paintings, videos and installations within it. 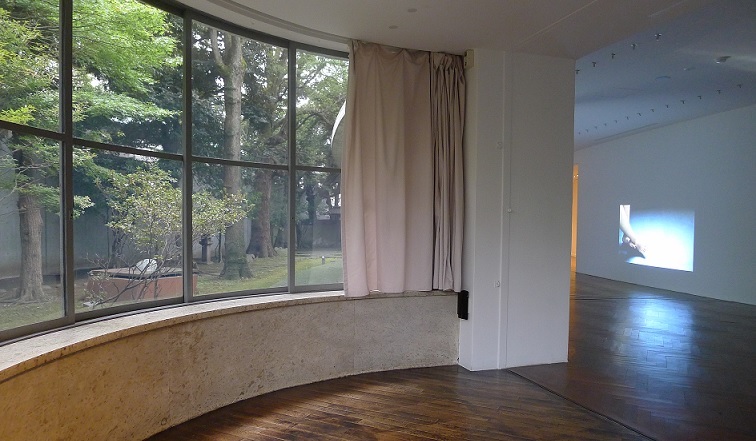 In the museum’s main viewing gallery there is a side ‘annex’ with a wonderfully curved window (original, from when the building was residential) looking onto, or into, the garden, and if you turn around, into the gallery. The museum is a venue for contemporary art from around the world. It is also a rare living showpiece extolling the minimal beauty of modernism. Significantly, this former Hara family residence is set within a landscaped garden, harking back to an era of great architectural experimentation, suburban expansion and garden design. We live in a different time and age and have different concerns and pressing issues, but we can, at least, have a similar visionary approach to urban planning. The ‘cookie cutter’ approach to Hong Kong urban planning is not making our lives better. At a minimum we should be discussing such topics as sustainable development, energy efficiency, and people-centred planning - not just preoccupied by land supply numbers. This article was first published in Ming Pao Weekly, 19 January 2019. Translation from English to Chinese by Aulina Chan.